by my Father who is in heaven. 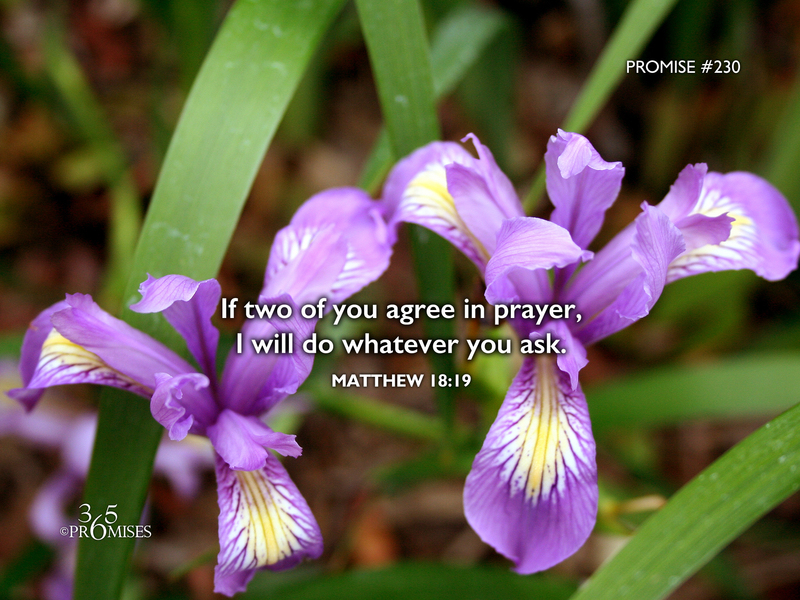 In today's promise, Jesus is speaking to his disciples and is encouraging them about how to pray. In the verse previous to this one, He tells them that whatever they bind on earth will be bound in heaven and whatever they loose on earth will be loosed in heaven. I wonder how the disciples reacted to Jesus' statements? After all they were just fisherman and common folk, yet Jesus exhorted them that they had an audience with the Creator of the universe any time, night or day. When I have reflected on this passage in the past, I have always wondered about the words 'anything'. Did Jesus really mean that they could have any thing they asked for if there was agreement by two or more? It seems that He said what He meant because any thing means any thing! However, we know from other Bible verses that the things that Jesus is referring to are definitely linked to the things that are already in God's heart. My prayer is that this promise would encourage each one of us today! God invites us to link our hearts with other believers on earth and come before His throne room and make our requests known to God. Don't be timid and don't be unbelieving. Come with a heart full of faith, believing that your Heavenly Father hears your requests and wants to answer your prayers!